Don't see your question here? Download our FREE re-roofing booklet for 50 pages' worth of Q&As, roof material comparisons, installer tips and much more! And have a look at our blog, where we run a Q&A series and we'll answer any question you post in the comments section. What is Metal Roof Network? The Metal Roof Network, otherwise known as Metal Roof Net, is a distribution point for quality wholesale, direct-to-consumer metal roofing and a network of authorized contractors. We're proud to offer expert analysis and sales of the best metal roof system for any application and the most qualified metal roof contractor to install it. Where is Metal Roof Network located? Metal Roof Network is based in Reno in beautiful northern Nevada, but we're able to supply our premium metal roofing materials across the country. Our customers are from northern Nevada, of course, but we've also supplied metal roofing for projects in Hawaii, Oklahoma, Oregon and across the entire state of California. We can recommend installers no matter where you live. As a supplier, not a contractor, Metal Roof Net employs no installers. Rather, we work closely with a network of roofing contractors and installation professionals in many regions. Depending on the location of your project, we may be able to direct you to a contractor who has a history with metal roofing products like ours. Please feel free to contact us about your proejct and we'll do our best to provide you with a referral for installation. What do I need to know about metal roofs? There are more choices and options in metal roofing than any other roof covering material, but you should know that not every metal roof is suitable for every application. Contacting Metal Roof Net about your project will help you quickly narrow the field to the most suitable choice and assure you of the best possible price for the material for your job. They can be, but the gap between a good metal tile or shake roof and a wood or asphalt composition roof isn't nearly as large as it was even a few years ago. Is a metal roof attractive enough for a nice neighborhood? What about my homeowner's association? This is one of the biggest misconceptions about metal roofing. Of all roof materials, metal is available in the biggest variety of colors, shapes and styles. It's very likely that in your very neighborhood there are beautiful metal roofs you've mistaken for shingles or concrete tiles. Nearly all of our materials and profiles have been approved in various communities, and we're always happy to work with you in whatever way you need to get approval from your HOA. Need more proof? Have a look at some of our favorite projects, now featured on Houzz! A properly selected metal roof is a permanent roof system. With little maintenance, it will last as long as your home. Do I need to tear off my old roof to put on a new metal roof? In many cases, no. Metal is one of the lightest roofing materials available, and it can right over most existing roofs with little preparation. I don't have a metal roof now - does that mean I can't re-roof with metal? No. Many homeowners are unaware that a roof replacement is an ideal time to upgrade their home while simultaneously addressing a major maintenance issue. One of the virtues of metal is that its light weight and rigidity make it an option for every type of home. In fact, if the structure of a roof can support any material at all, it can support metal - and that means engineering is not an issue. How does metal roofing compare to asphalt composition shingles? Find out with our FREE metal vs comp comparison sheet! How does metal roofing compare to concrete-based tiles and shakes? Find out with our FREE metal vs concrete comparison sheet! 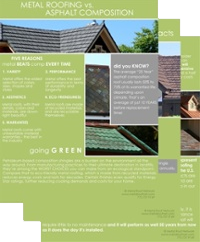 Is metal roofing considered environmentally friendly? Yes. Unlike most other options, metal roofs have a significant recycled content. Surprisingly perhaps, it's not. In fact, the vast majority of people who upgrade to metal report just the opposite. Coated metal roofs in particular have very low resonance and once fastened to the roof structure form a very tight and rigid assembly that often adds stiffness to the entire home. If we have a metal roof, will it make our home hot in the summer or cold in the winter? No. Unlike concrete tile or asphalt shingle, which store and transfer heat, metal absorbs and dissipates heat quickly. Air flow under the roof helps prevent the transfer of cold air and reduces freeze thaw cycles in the winter. Results include lower air conditioning and heating costs for your home. What should I know about fire and metal roofs? Steel is noncombustible. It is lightweight and will resist premature roof collapse from an internal fire. What can I expect of metal roofing during high winds? Metal is the stiffest, hardest, most durable roofing material you can buy. Unlike every other roofing material, a properly installed metal roof will stay on in high winds indefinitely. That's because they're mechanically fastened to the deck or the structure, while other roofs rely on their weight or adhesives, which are certainly inferior systems in extreme winds. There is simply nothing better than a good metal roof. Plus, all of our metal roof systems are tested and will meet or exceed Dade County hurricane specifications, which are the most stringent in the country. Not unless you want your roof to rust. Steel processing today is so sophisticated that rust is rarely an issue in a properly installed metal roof. Will hail damage my metal roof? Large enough hail can damage almost anything, but our metal roofs have the highest hail resistance rating available. How do metal roofs rate on earthquake safety? Metal roof panels are lightweight, flexible and structurally sound, making them one of the safest, most durable roof coverings available in earthquake-prone regions. Compare stiff, lightweight metal to conventional asphalt or concrete roofs, which weigh three to 10 times as much or more. Will I damage my metal roof if I walk on it? Not if you do so in accordance to manufacturer's instructions. But low-maintenance metal roofs almost eliminate that need. With your metal roof, it is no longer necessary to replace trim and shingles that have blown off or to patch leaks in badly worn areas. Will moss, leaves, dirt and debris damage or leave impressions on my metal roof? Like any roof material, metal can be compromised by accumulations of debris. Unlike most other roof materials, cleaning a metal roof of loose debris can be a relatively simple task. While it's unlikely to cause damage, it's always best to attempt to keep your metal roof free of accumulations - just like every other type of roof material.